I am honored to join Story Starters Boston, an organization that “uses children’s literature to give families the tools and support to talk about race and racism and to engage in family-centered social justice conversations” for this free event. Join me for a storytime featuring a selection of picture books that invite and support children’s responses to art and design, with a particular focus on characterization and representations of race, gender, and other aspects of identity. I’ll sign my books afterward, and I will also share a book list of titles to continue the titles I share that day along with other recommended books for Story Starters. Shake Up Storytime and Get Kids Talking about What They See, at the University of Maine, College of Education and Human Development, Orono, ME, Tuesday April 30, 2019 10:00 a.m. – 3:00 p.m. 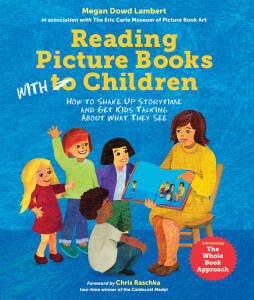 In this day-long session for educators, Megan Dowd Lambert, Senior Lecturer in Children’s Literature at Simmons University, will draw upon her book, Reading Picture Books with Children: How to Shake Up Storytime and Get Kids Talking About What They See (Charlesbridge 2015) to introduce participants to tools from the Whole Book Approach. Lambert created this co-constructive model for shared reading transactions in association with The Eric Carle Museum of Picture Book Art, where she worked as an educator for nearly a decade. After an overview of the Whole Book Approach and its roots in Visual Thinking Strategies and Dialogic Reading, participants will explore how using the Whole Book Approach can support readers’ critical engagement with characterization and representations of race, class, gender, and other aspects of identity. Both parts of the day will include time for participants to work in small groups with selected titles in order to apply and explore the tools, techniques, and strategies introduced in presentations. 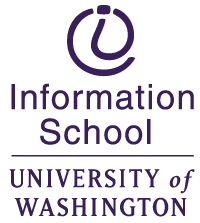 This semester, students in the University of Washington iSchool course, “Storytelling in a Digital Age,” taught by Prof. Breanna J. McDanel, are reading my book, Reading Picture Books with Children: How to Shake Up Storytime and Get Kids Talking About What They See. I will hold a virtual visit with the class via Zoom to talk about the Whole Book Approach. I was honored to be asked to give the 2019 Peg Davol Manuscript Critique for a published author. This year’s winner was Thea Guidone, and I had a great time working with her on her picture book manuscript. I will attend one day of the NESCBWI conference, Saturday May 4, to celebrate Thea, and to attend workshops and the volunteer dinner. My books will be for sale in the conference bookstore. In his final months in office, amidst a nationwide struggle for civil rights, John F. Kennedy framed the ongoing crisis as a moral as well as a constitutional and legal issue. More than 55 years later, people of color, immigrants from certain countries, women, and LGBTQ communities continue to face inequities. Join award-winning authors Joseph Bruchac, Lesa Cline-Ransome, Erica Armstrong Dunbar, and Pam Muñoz Ryan to explore how children’s literature can shed light on people past and present who are seen as “other.” Uncover stories of strength and struggle in the search for opportunity, freedom, and equality. Discuss the impact on all children of seeing stories about underrepresented groups in books and other media, and reflect on the role educators play in a time of social and political divisiveness. Consider new strategies to help students engage in civic discourse and become active, empathetic community members. How to Register Registration is required for the program. Conference space is limited – please register early. For more information, contact Esther Kohn at esther.kohn@nara.gov, 617-514-1649. Learn more about the authors and workshop presenters. Learn more about the conference sessions. Join author and educator Megan Dowd Lambert to see the Whole Book Approach in action with a group of children in a public library setting. Then, participate in a facilitated discussion about the storytime, followed by an overview of Whole Book Approach tips and tools to shake up storytime. Contact the Eldredge Public Library for more information. 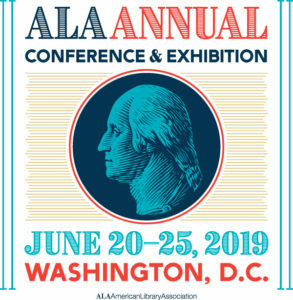 An Introduction to the Whole Book Approach for Magination Press, June 21, 2019, Washington, D.C.
Will you be at ALA Annual? I will be! I am looking forward to cheering on friends and colleagues at various events, including the Newbery-Caldecott-Legacy Awards Banquet, and the 50th Anniversary Coretta Scott King Award Breakfast, as well as at various publisher events. Stop by the Charlesbridge Publishing booth on Sunday June 23 at 11:00 a.m. where I’ll be signing my books, Reading Picture Books with Children and A Crow of His Own. I will also be at the Simmons University booth over the weekend to help support admissions efforts to our graduate programs in Children’s Literature. Click here for registration information and more details, including news about the exhibition I am helping to organize of author and illustrator Grace Lin’s artwork in the University’s Trustman Gallery, which will be on display throughout the month of July. To learn more about these programs, visit the Simmons website, email slisadm@simmons.edu, or register for an Information Session at The Carle. For tuition information click here. Courses are open to non-degree students, and are offered nights and weekends on site at The Carle. For registration information, please contact cathryn.mercier@simmons.edu. A full description of courses is available online in the Simmons Graduate Course Catalog. Classes may be subject to cancellation depending on enrollment. Listen to what students and graduates say about the program! Join Megan Dowd Lambert, author of Reading Picture Books with Children: How to Shake up Storytime and Get Kids Talking about What They See, for two Whole Book Approach storytimes at The Carle. Open to the public and free with Museum admission. 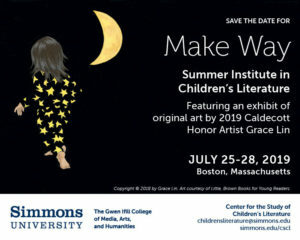 Take a look at this video to learn about graduate programs in Children’s Literature at Simmons University on the main campus in Boston and at the satellite site at The Eric Carle Museum of Picture Book Art. I will lead the following information sessions at the Carle, 125 West Bay Road, Amherst, MA. Join me to learn about non-degree graduate study options, as well as the degrees offered (MA, MFA, MA/MFA, and MA/MS) through the Simmons at The Carle partnership. Trainer with the MERGE for Equality Children’s Book Campaign “Developing Healthy Boys Training,” for the Pre-School Enrichment Team, Greenfield Community College, April 15, 2019. The Whole Book Approach and Critical Literacy, a program for teachers, librarians, parents, and other caregivers, sponsored by Nonotuck Community School and the Collaborative for Educational Services, Easthampton, MA, April 11, 2019. Speaker on the Whole Book Approach and Critical Literacy for the Week of the Young Child at Greenfield Community College, Sponsored by the Elms College School of Graduate and Professional Studies and its partnership with GCC, April 6, 2019. Trainer with the MERGE for Equality Children’s Book Campaign “Developing Healthy Boys Training,” at the MAAEYC conference in Mansfield/Foxboro, MA, March 29, 2019. Panelist, with moderator Jeanette Bradley, Alli Harper of OurShelves, author Andrea Loney, and author and editor Christian Trimmer, “The State of the Bookshelf for LGBTQ-Positive Picture Books” at KidLitCon 2019, March 22, 2019. Guest Lecture based on Reading Picture Books with Children: How to Shake Up Storytime and Get Kids Talking about What They See in the Book Studies Concentration Gateway Course at Smith College, Northampton, MA, January 11, 2019. Panelist on the “Secrets of Storytime” panel at the NEIBA annual conference in Providence, RI, September 28, 2018. With author/illustrator Javaka Steptoe, featured speaker on the Whole Book Approach at the 31st Annual Conference on Children’s Literature “Celebrating the Art of the Picture Book,” and the 16th Annual Ashley Bryan Art Show, Broward County Library, Fort Lauderdale, Florida, April 28, 2018. 12th Annual Literacy Essentials Conference, “Language Arts Alive: Bringing Joy Into Teaching and Learning,” at Central Connecticut State University, New Britain, CT. Writers Talk Writing Panel, Whole Book Approach Techniques presentation, and Dessert with the Authors presentation, April 7, 2018. Every Child Reads MA Legislative Briefing, the State House, Boston, MA, February 8, 2018. #WholeBookApproach Twitter Chat (storified here) with W.H. Beck’s Children’s Literature class at Chippewa Valley Technical College, February 5, 2018. Guest Lecture based on Reading Picture Books with Children: How to Shake Up Storytime and Get Kids Talking about What They See in the Book Studies Concentration Gateway Course, Smith College, Northampton, MA, January 11, 2018. Whole Book Approach guest lecture (via Skype) in TLS480 Children’s Literature in the Classroom, taught by Sarah Hannah Gómez, at the University of Arizona College of Education on November 13, 2017. Keynote address, “Read Alouds & the Whole Book Approach” at the The Connecticut Association for Reading Research fall meeting, September 19, 2017, University of Hartford, West Hartford, CT.
Book signing at the Charlesbirdge Publishing booth at the ALA Annual Conference, Chicago, IL, June 24, 2017. Words and Pictures: Picture Book Author/Illustrators Discuss the Whole Book, an Exhibitors’ Round Table panel that I moderated with author/illustrators David Hyde Costello, Duncan Tonatiuh, and Don Tate at the ALA Annual Conference, Chicago, IL, June 24, 2017. Simmons College Seminar: David Wiesner and The Art of Wordless Storytelling, co-taught with Jeannine Atkins and Cathryn M. Mercier at The ERic Carle Museum of Picture Book Art, June 17, 2017. Storytime featuring Dr. Seuss’s Green Eggs and Ham at the opening day of The Amazing World of Dr. Seuss Museum in Springfield, MA, June 3, 2017. Whole Book Approach workshop with teachers at Derby Academy, Hingham, MA, March 7, 2017. Whole Book Approach workshop for parents and other caregivers at the Hingham Public Library, Hingham, MA, March 7, 2017. Local Authors Book Fair fundraiser for Reader to Reader at the Barnes and Noble Hadley store, Hadley, MA. Whole Book Approach presentation and book-signing, March 4, 2017. Guest Lecture based on Reading Picture Books with Children: How to Shake Up Storytime and Get Kids Talking about What They See in the Book Studies Concentration Gateway Course at Smith College, Northampton, MA, January 12, 2017. Whole Book Approach model storytime and workshop with the Essex County Public Children’s Librarians Group, Maplewood Memorial Library, Maplewood, NJ, Monday, January 9, 2017. Leading Whole Book Approach Storytimes consultation with Guest Services staff at The Eric Carle Museum of Picture Book Art, January 4, 2017. Whole Book Approach Storytime and Book-Signing at The Eric Carle Museum of Picture Book Art December 30, 2016. Here’s a tweet thread about the books I read. Special storytime and book-signing featuring Real Sisters Pretend with illustrator Nicole Tadgell at The Eric Carle Museum of Picture Book Art on National Adoption Day, November 19, 2016. The Book Fest @ Bank Street, Bank Street College of Education, New York, NY, “Reading Picture books with Children: The Whole Book Approach” October 22, 2016. Go to the 2:05 mark at this KidLit TV link to see my interactive talk, and check out the other speakers and panels, too. Educator Night at The Eric Carle Museum of Picture Book Art, “Reading Christian Robinson’s Picture Books with Children” October 5, 2016. The Horn Book at Simmons Colloquium breakout session, “Unpacking Names and Naming,” October 1, 2016. Panelist with Todd Kessler of Coral Stone Press: If Reading Is So Important, Why Are Children’s Books Getting Shorter? Book-signing for A Crow of His Own and Reading Picture Books with Children: How to Shake Up Storytime and Get Kids Talking about What They See at the Charlesbridge Publishing Booth. Book talk and signing, Reading Picture Books with Children immediately preceding the 2016 BERL Lecture at The Eric Carle Museum of Picture Book Art Saturday April 23, 2016. Book-signing and moderation of illustrators’ panel with David Hyde Costello, Nicole Tadgell, Diane deGroat, and David Milgrim at the Eric Carle Museum of Picture Book Art for students in the Simmons College graduate course on the picturebook, April 10, 2016. The Fay B. Kaigler Children’s Book Festival at the Thad Cochran Center on the University of Southern Mississippi campus in Hattiesburg, MS April 6-8, 2016, where I accepted the Ezra Jack Keats New Writer Honor Award on Thursday April 7 as a part of this amazing festival. New Writer Medalist Don Tate, New Illustrator Medalist Phoebe Wahl, fellow New Writer Honor winner Julia Sarcone-Roach, and New Illustrator Honor winners Ryan T. Higgins and Rowboat Watkins were also recognized. School Library Journal Webinar on the Whole Book Approach with Megan Dowd Lambert, Charlesbridge Editor Yolanda Scott, and Eric Carle Museum Educator Emily Prabhaker, March 9, 2016. Family and Friends’ Weekend at Hampshire College, with author Norton Juster October 24, 2014. Meet the Medalists: Boston Book Festival at the Old South Church, Boston, MA. October 18, 2013. Conroe ISD Librarian Staff Development Day, “A Whole Book Approach to Reading with Children” Skyped presentation, August 20, 2013. ALA Annual Conference, Chicago, IL, panelist with illustrators Beth Krommes, Eric Rohmann and Chris Raschka, “Calde-Tots: Using Caldecott Winning Books with Young Children” June 30, 2013. Texas Library Association Annual Conference, Dallas, TX, “A Whole Book Approach to Story Time” April 24, 2013. The Akron Museum of Art, Akron, OH. March 25, 2013. Yale University Early Childhood Program, New Haven, CT, keynote speaker at, “A Celebration of Picture Books”, April 21, 2012. The Horn Book at Simmons Colloquium, “Engaging the Ear, Delighting the Eye: The World of Mother Goose” October 2011. Long Island Children’s and YA Literature Conference, Adelphi University keynote speaker on The Whole Book Approach, October 14, 2011. Junior Library Guild national webinar book talk program addressing The Whole Book Approach: May 12, 2011. National Association of Pediatric Nurse Practitioners annual conference, speaker on The Whole Book Approach, Baltimore, MD, sponsored by the Association’s Childhood Literacy Special Interest Group, March 24, 2011. The Horn Book at Simmons Colloquium, “Reading with Children: Words, Pictures and Design in Co-constructive Storytimes” October 2, 2010. ALSC pre-conference Drawn to Delight: How Picture Books Work (and Play) Today. “Gutter Talk and More: Picture Book Paratexts, Design and Illustration at Storytime” Washington, D.C., keynote speaker on picture books and visual literacy, June 2010. The Fairfield Public Library, Fairfield, CT professional development day, keynote speaker “The Whole Book Approach,” June 22, 2010. Connecticut Humanities Council annual conference keynote speaker on “The Whole Book Approach,” May 21, 2010. New York Library Association annual conference keynote speaker on “The Whole Book Approach,” April 9, 2010. Southern Adirondack Child Care Network, annual conference keynote speaker on The Whole Book Approach, Lake George, NY, November 13, 2009. Vermont Association for the Education of Young Children, keynote speaker, “From Cover to Cover with Brown Bear: An Introduction to the Whole Book Approach” Killington, VT, October 23, 2009. Lesley University Summer Literacy Institute, keynote speaker with two sessions on “The Whole Book Approach,” July 16, 2009. Massachusetts Literacy Champions, The Massachusetts Literacy Foundation, Boston, MA June 1, 2009. The Infant Toddler Council of Suffolk County, Long Island, New York, keynote speaker, “From Cover to Cover with Brown Bear: An Introduction to The Whole Book Approach” May 16, 2009. The Children’s Literature Council of Southern California, Los Angeles, CA., “I Can Read It By Myself—but Do I Want To? Inspiring Emergent Readers” March 28, 2009. Bennington County Child Care Conference, Bennington, VT, “The Whole Book Approach” and “A Book in Hand: Leading Multiple Copy Storytimes,” November 1, 2008. MA Title I Conference, Hyannis, MA “A Novel Idea: Connecting Picture Books and Novels in Middle and High School Curriculum” October 20, 2008. The Foundation for Children’s Books, Boston, MA with illustrator Diane deGroat for the FCB’s “Conversations with…” series, October 14, 2008. The New England Reading Association, Springfield, MA, “A Book in Hand: Multiple Copy Storytimes and Students Learning English as a Second Language” with co-presenter Dr. Jane Lannak of Boston University, September 25, 2008. Washington D.C. Public Libraries Youth Services Division, “The Whole Book Approach” and “A Book in Hand: Leading Multiple Copy Storytimes” June 4 & 5, 2008. The Vermont Humanities Council Literacy Programs Annual Meeting, “The Whole Book Approach” June 12, 2008. The New England Association of Independent School Librarians, Deerfield Academy, Deerfield, MA, “A Novel Idea: Connecting Picture Books and Novels in Middle and High School Curriculum” April 11, 2008. The Vermont Department of Libraries Mock Caldecott program, “The Whole Book Approach: A Caldecott Survey” December 17, 2007. The Foundation for Children’s Books, Boston, MA, with illustrator Tony DiTerlizzi for the FCB’s “Conversations with…” series April 24, 2007. The Capitol Center for the Arts, Concord, NH, “The Whole Book Approach” November 8, 2007. ALA funded series, “Let’s Talk About It: Jewish Literature: Identity and Imagination” at The Jones Library, Amherst, MA, “Multicultural Criticism of Contemporary Jewish Children’s Literature” presentation September 11, 2007. The Katonah Museum of Art, Katonah, NY, “From Cover to Cover: The Whole Book Approach to Evaluating and Using the Picture Book as an Art Form,” July 22, 2007. MA Title I Dissemination Project, Hyannis, MA, “Multicultural Criticism of Children’s Literature,” May 11, 2007. Skidmore College, Saratoga, Springs, NY, “Silly, Subversive, Serious Stuff: The Works of Dr. Seuss” presented at the Education Club annual meeting April 12, 2007. The Capitol Center for the Arts, Concord, NH, “The Whole Book Approach,” November 12, 2005. Simmons College Graduate School of Library and Information Science, Continuing Education Programs, “Sowing the Seeds of Visual Literacy” Workshop co-facilitator with Rosemary Agoglia fall 2004, spring 2005, fall 2005. Reggio Children/USA, The Eric Carle Museum, Smith College, UVM, Five Colleges, Inc., “Childhood Possibilities, Potentials, and Contexts: Voices from Pistoia, Reggio Emilia, and New England,” conference, “The Whole Book Approach” May 7-9, 2004. The Foundation for Children’s Books, Boston, MA “From Cover to Cover with Brown Bear: An Introduction to The Whole Book Approach,” March 25, 2004. Fresno State University, Fresno, CA “Frances Hodgson Burnett Beyond the Secret Garden” panel presentation, “Just a Whisper: Connecting Burnett’s Secret Garden with other touchstone works of children’s literature in an undergraduate survey course” April 2003.